Carpet Beetles are usually black or brown in colour, with some having a mottled effect on their back. 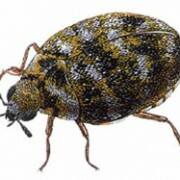 The adult carpet beetle is not a threat to your home but the larvae are, as they will eat the natural fibres in carpeting, clothing and other textiles. This is obviously a nuisance, as the larvae can cause a great deal of destruction where soft structures in your home are concerned. This has become such a problem that the carpet beetle is now considered a greater potential threat to textiles than the clothes moth. Nicknamed “woolly bears” the larvae of the carpet beetle are around 4mm in size and have a tendency to roll up into a ball when threatened. Their bodies are covered in long brown hairs and it’s often as they moult, and cast off their skins as they grow, that the signs of an infestation are identified. Adult carpet beetles present the greatest threat between April to June when they are searching for sites on which to lay their eggs. The types of sites that a carpet beetle likes to choose for its eggs is soft and fluffy, or surrounded by the kind of textiles which a larvae will like to munch on. An old bird’s nest is often sought out, as this is often a plentiful source of feathers, fur and other soft linings. 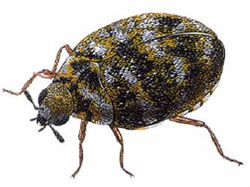 Pieces of felt, fabric or even a build-up of fluff in dark corners are all other types of site which will be attractive for the carpet beetle to lay its eggs. The larvae are the most active in October just before they hibernate. The life cycle lasts around a year and during this time the larvae can go without food for several months if required. Although the adult carpet beetles feed only on nectar and pollen from garden flowers, its young leave their own distinctive mark on soft furnishings and textiles. Look for well-defined rounded holes which run along the seams of the fabric and soft furnishings; this is where the larvae are biting through the thread. Keeping your home free of accumulated fluff and piles of dust can leave carpet beetles with nowhere to lay their eggs. Getting rid of old birds’ nests from eaves or the loft can also help to prevent the spread of the larvae outwards and into the rest of your home. Instead of handling powerful insecticides by yourself, why not let our highly trained technicians eliminate your carpet beetle problem? Call us today at 07886 249 030 for more information about our services. We’re looking forward to hearing from you!